Country House in France - Burgundy: 3 bed rooms, 1 bathroom, large garden. Country House (old farm) in nature Park Morvan (region Burgundy). At the end of the village with no passing through traffic. Very comfortable with 3 Bedrooms (in all bedrooms twin bed - king size + one Baby Bed), Kitchen with all necessary equipment, Bathroom with Shower, Bath and Washing Machine. Surrounded by a great garden and a lovely deck (terrace) with superb views across the landscape. The deck is connected to the living room and offers sunshine the whole day. Breakfast, Lunch and Dinner on the deck. That's Vacation! Oussy is situated in a small valley. Within 500 metres the river Yonne flows. In Oussy are no shops, but the nearby village Montreuillon (1 km distance) offers a bakery/small food shop, restaurant, café, church.. Supermarkets are situated in villages like Corbigny, Lormes and Château Chinon. All of them enchanted little villages at 15 minutes drive. Oussy is situated in the Morvan, a regional natural Park of 80 km x 60 km. No industry, no big cities, no four lane roads and only crops and livestock on natural basis. This area is for lovers of nature, walking, cycling and to Relax and enjoy silence. Nature is abundant because of the many mountains, lakes, rivers and endless forests. Every place is different, and the many small villages, towns and chateau's make it a very diverse area. The altitude varies from 250 meters to around 1.000 m in the southern pasrt of the Morvan. For lovers of culture and history is this living a fine base. In the mountains lies the historical origins of the State France. It is here that Vercingetorix united the Gallic tribes against the Romans. You'll find also the village of Vézelay, a pilgrimage site with its famous basilica dedicated to Mary Magdalene. A area filled with historical events en remains! We love to enjoy the peacefullness of our house in France. Located in a small village surrounded by nature, this is vacation for us. No noise, only birds singing and splendid nature around us. Walk in the forests and canoe on the river and in the late afternoon go to the beach at the lake and enjoy the evening sunset with some wine and other food. That's vacation! 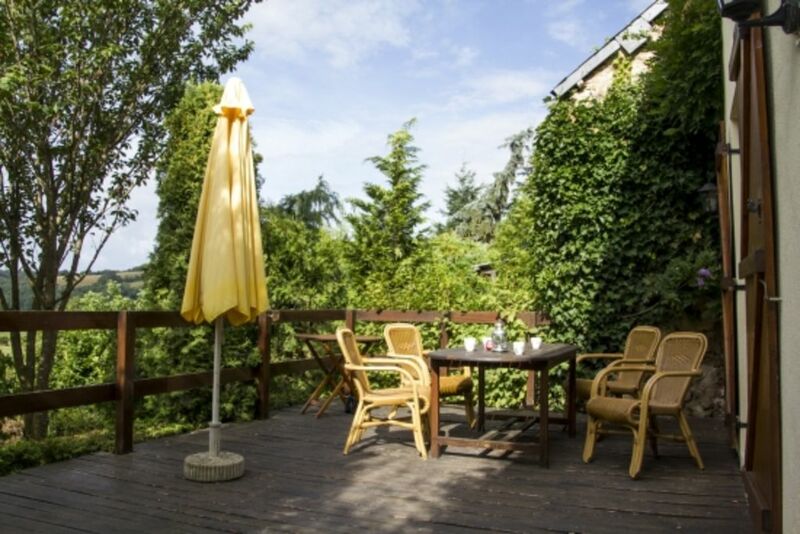 Peacefull, comfortable living with magnificant views, close to (swimming) lake. Free telephone usage for fixed numbers (not to mobile numbers) in all Europe states. Washing Machine in the bathroom with free usage of detergent. Only Television for DVD player. The property is in a very quiet location, totally untouched by tourism. It is as described, clean and generally well equipped. The decking area is beautiful and sunny with a lovely view across the fields. We stayed with two teenage boys and we enjoyed road cycling and kayaking and swimming at the nearby lake, as well as a few great walks, especially over the viaduct. As restaurants are a drive away we just ate in and enjoyed the view. One point to note is that the bedroom with the great view is upstairs and the bathroom is downstairs. You have to go through both of the other bedrooms to get to the loo which may not be convenient for everyone. The spiral staircase up through a hatch in the floor to one of the bedrooms may not be suitable for those with young children. Otherwise it is a delightful place to stay and ideally located for a bit of peace and quite. The owner also provided a fantastic 15-page doc about the property and area which we found invaluable.